Among them all, the Rankins, and especially “Sammy” Rankin, were considered the most inveterate jokers of the period. Many a good story is still told of Sammy and the manner in which he used to sacrifice his neighbors, who as often sought to get even with him by returning the compliment, although Sammy was termed “smart enough to hold his own and more too.” For that reason it was exceedingly gratifying to his many friends if they could get the laugh on him. Wiley owed Sammy one on the last time he had been made a victim, and to that moment had pined for an opportunity to repay the joker. As will be seen, his chance had come. Lifting the jug to Sammy’s hand, remarking that it was a cold morning, that a drink was a good thing at such a time, and that the jug held as good whisky as was ever made, he bade Sam drink heartily. Wiley laughed and bade good-by to Sammy by inviting him to meet him again some day for another drink, and advising him to look sharp if he desired to pay off the score. Whether Sammy did or did not pay off the score does not appear among the chronicles of the time, but the popular conclusion is that if he attempted it he succeeded. Source: Ellis, Franklin, 1828-1885. History of Fayette County, Pennsylvania: with biographical sketches of many of its pioneers and prominent men, edited by Franklin Ellis. According to advertisements and notices of her departure published in the Belfast Newsletter, the Earl of Donegal, Duncan Ferguson, master, left Belfast, Ireland on October 2, 1767. By December 22, 1767, 81 days later, she with about 294 Irish passengers of 64 different surnames had arrived in Charleston, South Carolina. They were sworn to being Protestant (probably Scots-Irish Presbyterians). Pages 313 to 326 of the South Carolina Council Journal No. 33, January 6, 1767 to December 22, 1767, obtained from the South Carolina Department of Archives and History in Columbia, SC and available on microfilm BMP D552, CO 5/490, Pro Reel 48.
Who are the “Scotch-Irish”? There are some who maintain “there is no such animal.” One must therefore consult the authorities. The late Theodore Roosevelt in his “Winning of the West” says “The dominant strain in their blood was that of the Presbyterian Irish – the Scotch-Irish, as they were often called.” He further remarks that “It is doubtful if we have wholly realized the importance of the part played by that stern, virile people, the Irish, whose preachers taught the creed of Knox and Calvin. The name ‘Scotch-Irish’ is an awkward compound, and is in many quarters condemned. Curiously enough, there is no one who seems to object to it more strongly as the Irish Catholic. While his feelings toward the ‘Far Downer’ are certainly not affectionate he is nevertheless anxious to claim him with his deeds and trophies, as simply Irish, and grudges to Scotland the claim to any share in producing him. It must be admitted, however, that there is a point of view from which the Scotch-Irish may be regarded as more Scotch than Irish. The difficulty might be compromised by calling them Ulstermen, or Ulster Presbyterians. 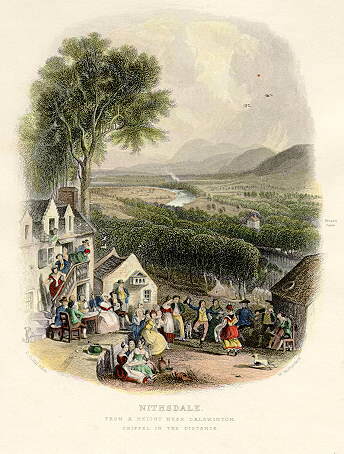 In his book entitled “The Making of Pennsylvania,” Sydney George Fisher, in writing of the settlement of Scotch-Irish in eastern and western Pennsylvania, states “The western Presbyterians were almost exclusively ‘Scotch-Irish’; always sought the frontier and advanced with it westward. In religion there was but little difference between the two divisions, but in character and temperament the western Scotch-Irish were more excitable and violent.” The Whiskey Insurrection proves this, and it must be admitted that the Scotch-Irish were back of that. I will first mention a few names from the nearby counties, exclusive of Allegheny County. 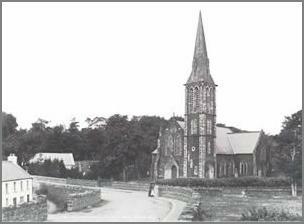 Pictured here is the Cuningham Memorial Presbyterian Church. This ite was formerly occupied by the “Sundialed Meeting House”. It received its name from a sundial which was inserted in the wall of the south gable of the church and bore the inscription “John Wylie, 1727“. (Wylie was one of the defenders at the Siege of Derry). The Sacrament of the Lords Supper was administered for the last time in the old building on Sunday 11th April, 1880. Wylie. First recorded person with this surname in Orkney: “John Wylie, Deerness, 1601: the Scottish surname Wylie is usually explained as a variation of the first name Willie. . .in Orkney the surname Wylie is very common and it is doubtful if it has been derived in this way: much more likely to be a nickname from Middle English ‘wile’, meaning ‘deceitful’ or perhaps from ON (Old Norse) ‘vela’ to trick: a surname associated with the parish of Deerness and the island of Burray: Wylie is also a very common name in Kirkwall. Looking east from Auchengibbert Hill with Tynron Doon in the right foreground and the valley of the River Nith (Nithsdale) beyond. There are many ways to spell the surnames pronounced as the words wi-le and wi-ly above but, no matter how it’s spelled, there can be little doubt as to the origin of the name. The word comes to us from Old Norse spoken in Britton and Scotland in the 9th and 10th centuries A.D. and was used to describe the little red dog-like animal known today as the fox. In the 10th and 11th centuries the word is found in Middle English and again used to describe the fox. In the 13th century the word “wile” or “wyle” means “crafty or sly, like a fox”. There is no doubt that the word meant a fox or to be like a fox. The first time it appears as a surname is in 1355 Scotland when Donald Wyle of Dalswinton registered his lands in Nithsdale, on the River Nith. Dalswinton was a town in the area and lies between the present day towns of Thornhill and Dumfries in Dumfriesshire in the Galloway District of the Southern Uplands of Scotland. On August 4, 1376 the same Donald was granted Ensigns Amorial at Dumfries Abbey as “DONALD OF DALSWINTON – WYLIE OF THAT ILK”. The principle charge of Donald’s Arms was a fox and all Arms granted since to Wylies in Scotland have born either a walking or running fox. Over the next few years Wylies of various spellings, presumeably descendants of Donald, appear all over Scotland and Northern England. Thomas Wyly is listed in the 1379 Yorkshire Poll Tax, John Wili is in Montrose in 1434, William Wyly appears in Ayrshire a few years later and Richard Wyly was Vicar of St. Mary’s Dundee in the 1450’s. The Wylies spread throughout England and Ireland for the next 200 years and then began their incredible journey to the new worlds. Many of the Wylies in England used the spelling Wyllie and Wyley, while the Irish Wylies prefered Wiley. It is important to note that names were spelled differently every time a marriage, will or deed was recorded. Sometimes the famiies changed their names just to “fit in”. Some Wylies changed their spellings to Wiley and some Wileys changed to Wylie after immigrating to America. I’ve found branches of my own family using Wily, Wiley, Willey and Wylie between 1788 and 1920.